A few months ago, I posted a short review of Edy's new Superman-inspired Krypton Cookie Dough ice cream. In it, I mentioned that each container in this new DC superhero product line had a comic on the back of it. Well, I've finally found all of the comics, and not just for Superman, but for the Batman and Wonder Woman ice creams as well. Companies should be rewarded for including comics as part of their comic book tie-ins! So here, unsuspecting public, are all 12 of the comics, whether you want them or not. You can click on each individual picture to get a larger image. And then it's on to Batman, in "Seeing Double...Double". 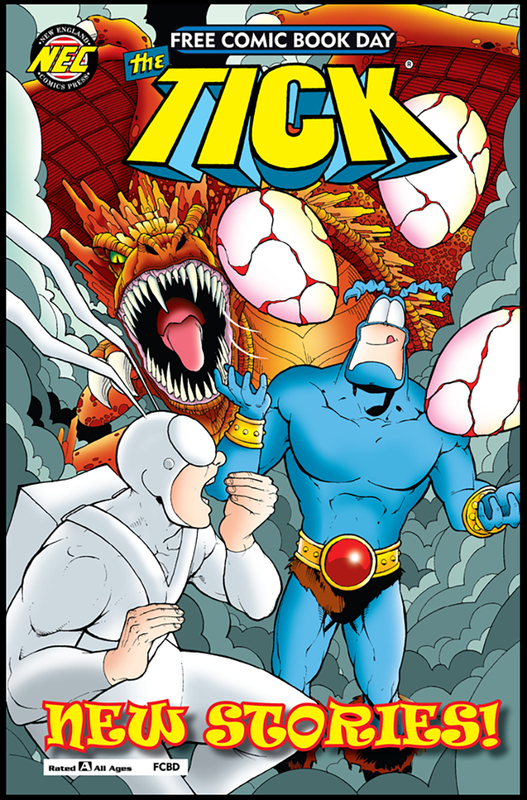 Every year for Free Comic Book Day (since 2013), I've been lucky enough to travel to Boston and New England Comics to sign copies of the annual Free Comic Book Day issues of The Tick. This year was like previous years in that it was awesome, but I also managed to grab a number of original art pages while I was there, so I thought I'd show them off here. I started off the day at NEC Quincy, which was busy from the time the doors opened until after I left at around 3:00. From 4:30-7:00, I signed comics at my favorite NEC location, the Harvard Square store. It was surprisingly busy at this store as well, and there were still people wandering in as the shop closed down for the night. These kids walked in and were just enthralled by the Batman: The Brave and The Bold episode that was playing. I'll admit that I was watching it, too. So let's take a look at some of this art that I picked up this weekend. 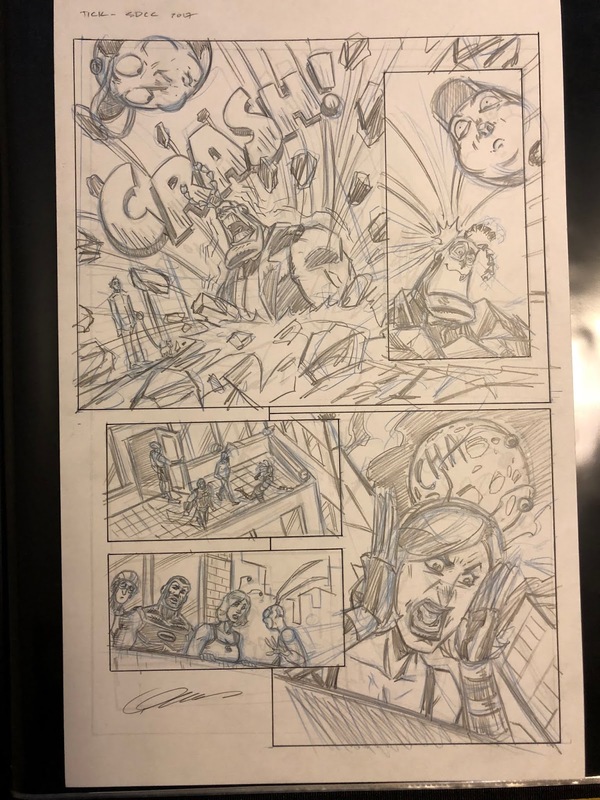 The first is a Son of Hitler page from Jeff McComsey. Jeff's not from Boston, but I managed to meet up with him on my way to New England. This is probably my favorite page from the book - one of the main character dons a pair of glasses as a disguise, which is just about the most comic book thing in the world, so I was glad to pick this up. I spent some time at NEC Quincy with artists Alex Harris and Tony Sedani, and I was able to get some artwork from both of those gentlemen. The first two pages are from the new Tick #2. Alex drew the short story I wrote that showed up in the back of this issue. 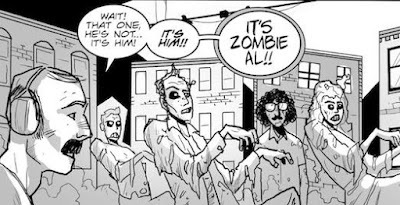 The story in question didn't have The Tick in it, and Arthur was only on the first page, but dangit, I enjoyed writing it. And Alex did some nice work with Running Guy and Rubber Ducky. 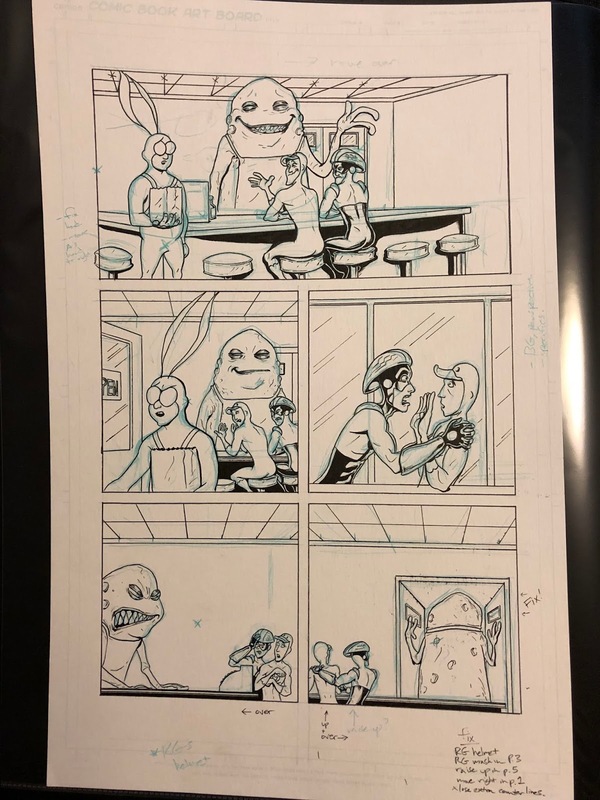 Tony Sedani had a three-page short story in this year's FCBD issue, and I was able to grab one of them from him. This particular page features a nice rooftop scene with The Tick and Arthur. 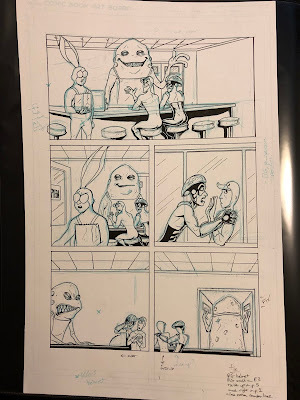 After FCBD ended, I met up with Ian Nichols for dinner and comic talk (this is my life), and he surprised me with a page from last year's Comic-Con Special issue. I love that handwritten sound effect! I hope everyone had a great Free Comic Book Day. What comics did you get? Anyone still looking for a particular issue? 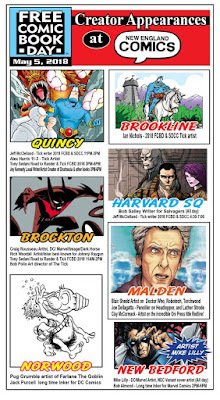 Free Comic Book Day 2018 signing at New England Comics! 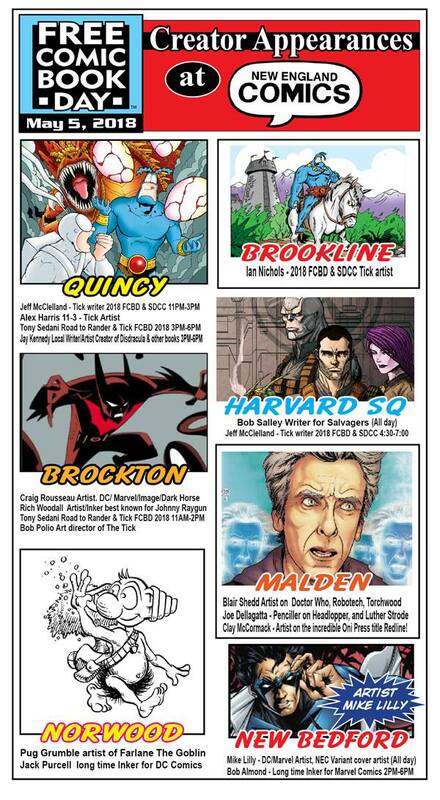 Free Comic Book Day is nearly upon us, and once again I'll be traveling to Boston to join in the festivities at to different New England Comics locations! If you're in the area, you can stop by to get some books, and I'll even force you to let me sign the new issue of The Tick. 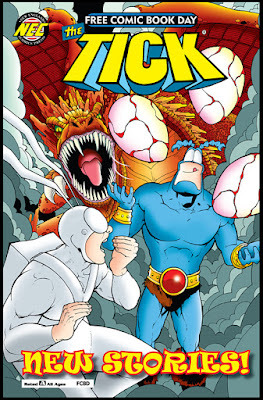 Artist Ian Nichols will also be at NEC (Brookline) signing and sketching. Note that the information for the Quincy store states that I will arrive at 11pm. This is probably incorrect. Either that, or I'll be there for quite a while. Either way, there'll be free comics! Hope to see you there!